Just curious if the (as we say in Massachusetts) "Smahtah" folks here would explain what changed around 1982 and again around 1995 to drastically increase the slope? I'm trying to relate this to the two drastic declines which followed in 2002 and 2008. 1995 and up was the .com bubble, powered by the internet and easier access to trading online or over the phone (instead of using real paper) but I don't know why it happened in the early eighties, looking forward to learn as well. 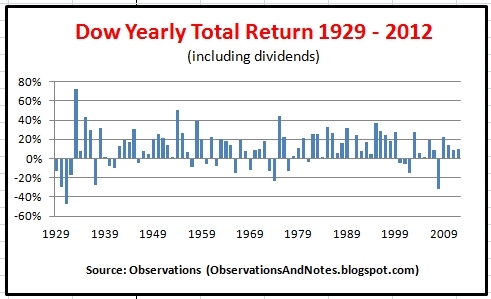 The market has gone through growth and pull back cycles going back generations. You may want to look at a log scale chart when trying to compare over very long time periods. The effect of compounding distorts things when looking at long time frames. This reminds me about something I ponder all the time. What I think happened in the 80s is that stock ownership changed from something available to only the wealthy to something available to everyone. Regulatory changes (I think!) and lower-cost brokerages meant that huge swaths of the population could reasonably play in the stock market that never could or did before. This created a huge, decades-long tailwind to stock prices as massive new demand arose for securities. This long, but nonetheless one-time, event has more or less played itself out, and this tailwind is gone. Now, pretty much everyone who is going to play in the market already does, through index funds and/or their 401(k)s, etc. Not only is this tailwind gone, but as the boomers retire and pass away, it may actually reverse a bit, as demographic trends lower (somewhat) the demand for securities. When people talk so glibly about the fortunes made in the market if you had just bought, say, $10,000 of KO in 1985, I think they ignore this dynamic. 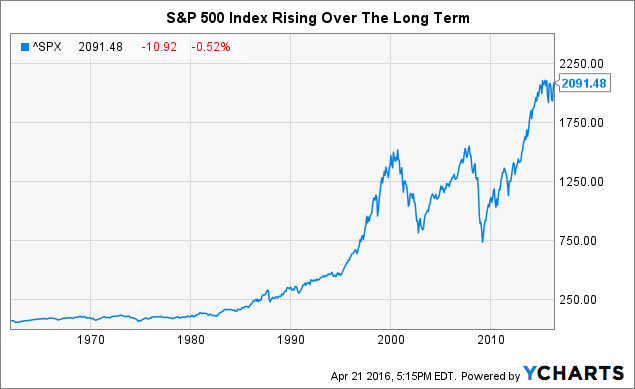 It has skewed how we think about the market and expected returns. I've never read anything about this, but if anyone knows of any books or articles that discuss it, I would love some links. In the early 80's, Reagan took over from Carter (please let's not start a politics discussion) and our economy pulled out of the general malaise. Technology really started to balloon, in the 90's, the internet age really expanded things, as well. Also, discount brokers made stock ownership easier (Kerim mentioned this). They've also changed the structure of the indices. Maybe inflation impacted things, as well? Just bringing up some ideas that may have contributed. It does point out how bad the 73-74, 2000/2002 and 2008 recessions really were although the 1992-2000 boom times are clearly visible. There have been some changes in market participation over this time frame due to cheaper commissions, lowered minimum initial purchases by mutual funds and, IIRC, more acceptance of odd lot* transactions. More importantly (read: bigger financial impact) was the institution of 401(k)s and IRAs with the subsequent reduction in defined benefit pensions. I have no specific numbers but I suspect the transition away from pensions to 401(k)s have balanced each other out over the long term. The more I think about it, I think Kerim has a point about tailwind judging about the litany of articles discussing the woeful retirement savings predicament that exists today. * For you youngsters, there was a time many years ago where you had to purchase stocks in "round lots" meaning 100 shares per transaction. You could purchase "odd lots" (not an even multiple of 100 shares) although commissions were significantly higher which would make the transaction uneconomical except for go-go growth stocks. Buying a small number of shares, for example 5, 10 or 20 regardless of share price, would not even be accepted by some brokerages. This was part of the reason for the popularity of DRIP accounts at transfer agents -- fees for DRIP accounts were also substantially lower. Current time: 04-18-2019, 05:34 AM Powered By MyBB, © 2002-2019 MyBB Group.